Saturday, August 1, 10 am - 2 pm. Paula Fuga and Raiatea Helm, Saturdays in the Shade Concert at Queen Ka’ahumanu Shopping Center. Prizes, including a trip to Las Vegas. Kahului. FREE! Saturday, August 1, 11 am – 2 pm. DOGust Shelter Dog Birthday Party. Maui Humane Society. August 1 is the universal birthday for all shelter dogs with unknown birthdays. Celebrate with music by the Haiku Hillbillys, bouncy castle for kids, scavenger hunt, and more. Food trucks available. FREE but birthday gifts of toys, treats, blankets, and donations are welcome. Saturday, August 1, Grand Opening of aFeinberg Gallery. The Shops at Wailea. 5 pm for VIP/Collectors, 6 pm for the public. Sunday, August 2, 7 am – 10 am. Kraig M.K. Vickers Honor Run (5K and 3K). Kanaha Park, Kahului. In honor of Maui’s own Kraig M.K. Vickers, killed in action in Afghanistan. Thursday, August 6, 7 pm. The Nuclear Age at Seventy: David Krieger, founder of the Nuclear Age Peace Foundation will talk about the 70th Anniversary of the bombing of Hiroshima and Nagasaki. UH Maui College, Pilina Building. Free. Thursday, August 6, 6 pm - 9:30 pm. International Support with Aloha. Learn about Hawaii’s history, international support, and international law regarding events from the 1890s. Na ‘Ai Kane O Maui, 562A Front Street, Lahaina. Free. Friday, August 7, 5:30 pm – 9 pm. Maui Huliau Food & Film Festival. A farm-to-table celebration of local chefs and student-produced films. Live music, silent auction, student film competition, and aerial silk performances. For 21 and over. Seabury Hall, Makawao. Saturday, August 8, 10 am – 2 pm. Family Day at the Hui No’eau Visual Arts Center. Scavenger Hunt, Face Painting, Bake Sale, Hands-On Art Workshops, and more! Makawao. FREE! Saturday, August 8, 10 am – 4 pm. Doorway Into Light Open House. The Death Store – live music, prizes, etc. Does death have to be a scary topic? Learn about living wills, conscious end of life planning, and resources for you and your loved ones. Haiku Pauwela Cannery, Haiku. Saturday, August 8, 5 pm – 8 pm. Moonlight Mele Concert at the Bailey House Museum, featuring George Kahumoku, Neal Yakamura, the UHMC Institute of Hawaiian Music, and the keiki of Halau Na Hanona Kulike O Piilani. Special concert price of $5/person, FREE for children under 12. Wailuku. Tuesday, August 11, 6 pm – 7:30 pm. Governor Ige’s Community Forum on Health Care and Availability of Medical Services on Maui. Provide your input. Maui Waena Intermediate School Cafeteria, Kahului. Thursday, August 13, 7 pm. The Real Food Revolution: An Evening With Ocean Robbins, founder of the Food Revolution Network. A candid and inspiring look at the truth about food. Ocean is the son of John Robbins, of Diet for a New America. Makawao Union Church, Makawao. $20 suggested donation. Friday, August 14. 6 pm. Maui Calls: Celebrating the Old Boat Days of Hawaii. The MACC’s annual signature gala, with live music, dinner, dancing under the stars, and silent and live auction. Must be 21 and older. MACC, Wailuku. Saturday, August 15, 8 am – 4 pm. Auwahi Volunteer Forest Restoration Trip. Volunteer in a conservation area of Maui. Upcountry. Sunday, August 16, 10 am – 6 pm. Pop Up Jungle Boutique. Local artists offer their handmade creations. Pauwela Cannery, Haiku. 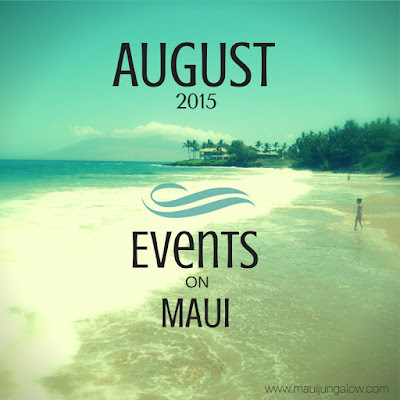 Kiawe Harvest, July 1 - September ?, all islands. Join with others on Facebook and participate in kiawe seed pod harvesting. Free. Saturday, August 15, 9 am – 12 noon. Revitalizing ‘Ulu (Breadfruit) Learn about ‘ulu planting, harvesting, preparing and eating with Ian Cole of the National Tropical Botanical Garden’s Breadfruit Institute at Kahanu Gardens. Maui Nui Botanical Gardens, Kahului. $45 visitors, $20 members. Saturday, August 15, 4:30 pm – 9:30 pm. Whale Trust Maui Benefit Dinner and John Cruz Performance. Farm to Table Dinner, silent auction, live music hosted by Lumeria Maui. Makawao. Friday, August 21 – August 30. Various times. MAPA Live presents Evita, with Amy Hanaiali’i Gilliom. Hawaii’s top selling female vocalist returns to her musical roots to perform the title role of Andrew Lloyd Webber’s musical. MACC. Saturday, August 22, 9 am – 12 noon. ‘Uala (Sweet Potato) Workshop. Learn about the cultural importance of ‘uala, traditional farming practices, varieties, recipes, and harvesting. $45 visitors, $20 members. Saturday, August 22, 11 am. Sweet Paradise Chocolatier 4th Anniversary Party. Sweet Paradise Chocolatier is celebrating 4 years in business with random acts of chocolate, samples to try, a chocolate fountain, and giveaways. The first 50 people to arrive will be entered in a contest to win 3 months of free chocolate. Wailea Gateway Plaza, Wailea. Saturday, August 22, 8 am – noon. Maui Friends of the Library Warehouse Sale. All books and media will be 10 cents or 12 items for a dollar. Items are free if used for Maui County by educators, librarians, staff, or parents homeschooling. One free item per child. MFOL Warehouse, by the MFOL Bookstore in Pu’unene. Hansen Road will be open. Sunday, August 30, 7 pm – 8:30 pm. Maui Improv Show. Enjoy live, unscripted entertainment with local Maui residents. Doors open at 6:30 pm. $5 only. Pro Arts Playhouse, Kihei. WOW - Wailea on Wednesday: On Wednesday nights in July at the Shops of Wailea, learn to play ukulele at “Ukulele Mix Plate,” 6 – 8 pm.